Residents of Jewish communities in Judea have had enough of the illegal Arab building that authorities allow to run rampant. 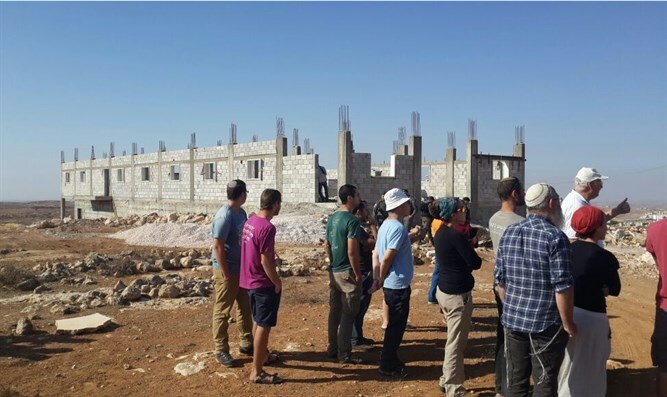 Dozens of residents of Yatir and Susya in Judea participated today in a march towards a nearby hill, where Arabs are erecting a school building on state land. The civil administration has released an order to stop the building immediately, but this has not prevented the Arabs from continuing to build at the site; they simply have timed advances in the building with holidays, when inspections are sparse. The school comes in addition to four additional sites built illegally by Arabs which surround the Jewish community of Susya. The Har Hevron regional council pointed out the fact that building developments spanning the size of a city inside “Area C” several kilometers from Susya were discovered. Apparently, the quantity of houses already in place there will retroactively cause authorities to allow the building. “Authorities have the tools; without a doubt, we can stop the lawbreakers,” Damari concluded.